Members of the Evangelical Free Church of Embarrass shingle in Biwabik this spring. From left: Scott Dane of Gilbert, Doug Gettle of Virginia, Bruce Sweney of Embarrass, Rolf Swanson of Hoyt Lakes, Jeff Poppema of Embarrass, Matt Tuchel of Soudan, Paul and Carol Knuti of Embarrass, Ethan Stone – Habitat Partner family of Virginia, John Filander of Biwabik, Don Taylor of Embarrass, and Joe F. Oakley of Palo. Submitted photo. You will rarely see them at a home dedication or a ground breaking. They like to stay off the radar. Although I have snuck a few photos of them at work, I am not allowed to share them. These gentlemen are all retired and could be spending their well-earned retirement doing anything they want. Thankfully, they want to help us and our partner families. Our “Quad City Regulars,” a core group of four that sometimes grows to six, donate their time and talent to North St. Louis County Habitat for Humanity up to twice a week. Although I have dubbed them the “Quad City Regulars,” that has become a misnomer – they now will meet at the Habitat office building and carpool as far as Cook if necessary. And when I say talent, I mean it. These are the volunteers I turn to when we need final trim and door installation, counter tops and cabinets. Come to a home dedication and see what high-skill work they do. Thanks to them, our homes are finished like the best custom home you can buy. And our partner families do just that – they BUY them. Of course, we love all of our volunteers! Businesses, churches, clubs, families and groups of friends have all helped us build. 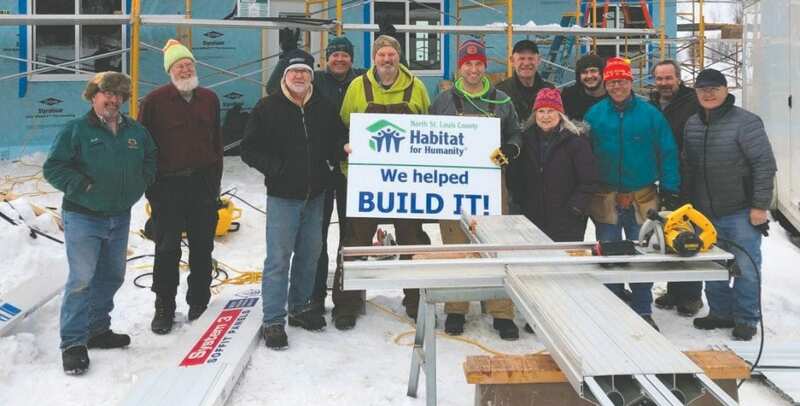 There are other community members upon whom we deeply rely, such as Harold Wentland of Hibbing, who has been the unofficial mentor for our school build students since our affiliate began. And, of course, some of our own Habitat partner families and their extended family members have become regular volunteers as well. This is truly an example of bringing people together to build homes, communities and hope. Growing our core volunteers and continuing to engage our partner families and their friends are very important to Habitat as we seek to partner with more families and build more homes in our lovely Iron Range communities. Another group of quiet heroes are our lunch providers. These kind people cook up lovely meals which they then bring to the job site to feed our hard-working build volunteers. Again, these volunteers are often associated with a church or club, but other excellent cooks have also reached out as individuals and brought their talents to our job sites, including, of course, partner family members. Always heartily welcomed on the job site, these volunteers provide the food and talent to make a delicious meal to ensure our builders have the energy to complete the day. Sharing a meal made especially for a volunteer, in appreciation of their hard work, is another opportunity to deepen our relationships with each other and build a stronger community as we build a home. North St. Louis County Habitat for Humanity has partnered with 90 families in 14 Iron Range communities over the course of the past 24 years. Starting with a staff of zero, we now are four people strong. Obviously, four people cannot build five homes a year! In the course of a build season, over 1,200 volunteers provide almost 10,000 hours of donated time and talent and another almost 1,000 provide lunches, sit on committees, serve on our board and help us with our fundraising mailings and events. Without all of our volunteers, we could not be the successful organization we are. Without all of our volunteers, these 90 families might be experiencing a very different life journey instead of living in a simple, decent and affordable home of their own, built with them by their neighbors. Without our volunteers, fourteen Iron Range communities would not have these lovely homes added to their communities and these hard-working families added to their tax rolls. Ultimately, without our volunteers, we would not exist! So, we send a big THANK YOU to all of our volunteers, from those that donate a day a year to our “Quad City Regulars.” Whatever you are doing to help Habitat help our neighbors with a hand UP into sustainable housing, you are critical to our and our partner families’ success. Your hard work is also helping our Iron Range communities become stronger and more welcoming as we fill empty lots with lovely, new, green energy and affordable homes. And if you haven’t yet taken the time to join any of these wonderful groups of supporters, we encourage you to join in the fun of building homes, communities and hope on the Range. Susan Garrett lives in Cotton, MN. She is the community relations manager for North St. Louis County Habitat for Humanity.